Foss Lake and Foss State Park offer 8,800 uncrowded surface acres in western Oklahoma for water recreation such as boating, swimming and fishing. Located west of Clinton, Foss Lake is a major destination for swimmers, boaters and anglers alike. The centerpiece of Foss State Park, this 8,800-surface acre lake is known especially for its sand bass, striped bass hybrids, catfish, saugeye and waterfowl hunting. Dive in at one of the swimming beaches, cast your line at an enclosed fishing dock or enjoy a game of disc golf at one of the park’s recreational facilities to complete your day on the water. The area surrounding the lake boasts plenty of opportunities for outdoor fun as well. Hikers can hit the Warrior Trail, featuring 19 miles of looping trails on the south side of the lake. Enjoy the twists and turns of this intermediate-level trail winding through a mixture of prairie grassland and bottom-land forest. Foss State Park also offers five palapas (open-sided dwellings with thatched roofs) on the lake’s dazzling Sunset Beach. If you’re feeling festive in the summer, drop by for the annual Christmas in July event for a fun and quirky state park celebration you won’t forget. 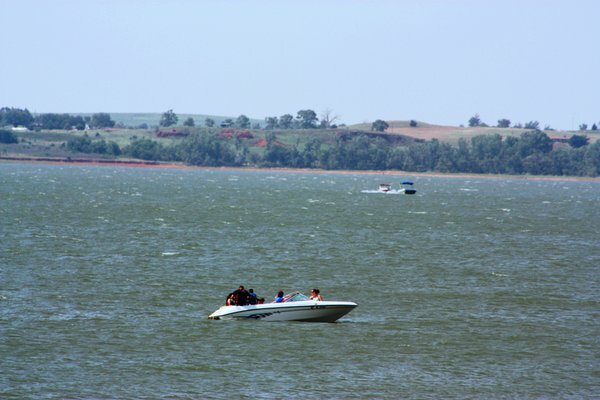 Approximately 250,000 people travel to the shores Fort Cobb Lake each year, making it one of western Oklahoma’s most popular outdoor attractions. Located about an hour north of Lawton and a little over an hour from Oklahoma City, this shimmering treasure offers a great weekend getaway for city dwellers looking for a long weekend of lakeside fun. The area is also a popular destination for hunters, with approximately 3,500 acres of rangeland home to game like quail, rabbit, dove, deer and turkey. After you’ve explored your surroundings at Fort Cobb State Park, take a quick drive to the charming small town of Carnegie where you can catch a flick at the Liberty Theatre. The oldest, continually-operating movie theater in the state, this historic stop will transport you back to the Golden Age of Hollywood. Settle in with fresh popcorn and one the Liberty’s famous chili cheese “Show Dog” coneys while you enjoy a 35mm screening of the latest blockbuster at this architectural gem located just south of Fort Cobb Lake. Great Plains Country in southwestern Oklahoma is home to a number of fantastic lakes where you can enjoy water sports, swimming, boating, fishing and more. Enjoy some of the best fishing in southwestern Oklahoma at Tom Steed Lake near Mountain Park. Here you can reel in catfish, crappie, bass and a variety of other species while enjoying stunning views of ancient mountains and rolling plains. The lake is surrounded by the jaw-dropping Great Plains State Park, where you can partake in rock climbing, camping and miles of biking and hiking trails. You can also explore the ruins of the 100-year-old Gold Bells Mine that once operated in the area. Dive in at the swim beach, launch your watercraft from the boat dock or cast your line from shore at this gem of a lake in the heart of southwestern Oklahoma. You’ll likely work up an appetite on the water, so hop over to the Tom Steed Bait Shop located just across from the main boat dock at Tom Steed Lake. You’ll find a lot more than bait at this under-the-radar spot, like juicy cheeseburgers, homemade pies and desserts, and plenty of ice-cold beer. Continue your adventure with a drive on the Wichita Mountains Scenic Byway, or stop in and see what’s happening at the idyllic cobblestone community of Medicine Park, less than an hour away. Once you’ve gotten a taste of this stunning area of the state, you’ll want to get back here as soon as possible.